Sennin Falls (仙人滝) is one of 200 Osaka Waterfalls located in Mt. Ontake. It is 30m tall. Sennin literary means mountain hermits. It was named for Sennin because the believer of Mt. Ontake Takigyo, religious practice at waterfalls. The water of the falls contains Sulfur because there are many Onsen springs around this area. It is located nearby the climbing route of Mt. 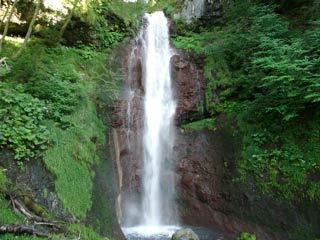 Ontake, many prayers and climbers visit this waterfalls before or after the climbing. 2. use bus to Nigorigo Onsen. The altitude: 1800m from the sea level.